Using the cleverly nuanced Open Dyslexic font to aid letter differentiation. 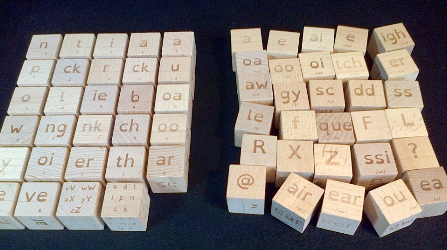 STAGE TWO of the Alphabetic Code – the 175+ spelling variations for those same 44+ sounds (the Complex Code). 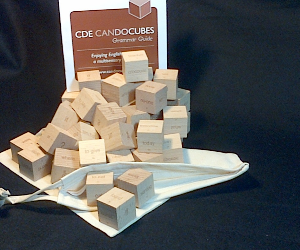 + Student tray containing hardwood, 26mm, Stage One cubes, laser-engraved with the Simple Alphabetic Code. 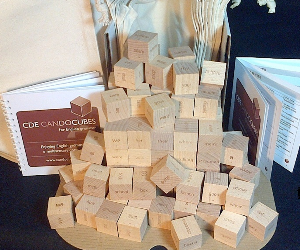 Tray contains cubes 1 -8, comprised of cube 1 x six and three each of cubes 2 – 8 (to facilitate using the same grapheme/phoneme more than once in word and sentence construction). 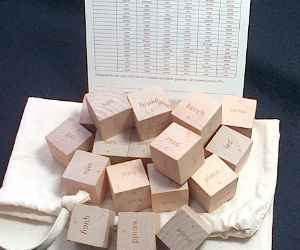 + Student tray containing hardwood, 26mm, Stage Two cubes, laser-engraved with the the Complex Alphabetic Code plus capital letters, double letters, split-vowel digraphs and basic punctuation. 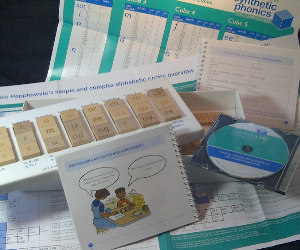 + Laurie Fyke’s Teacher’s Guide and Template Book (including printable worksheets) available for download (on purchase).